MSI had lots and lots of goodies on display at Computex, and here are a few of the highlights. We will skip the laptops, craptops, and widgets, and show you the mobos and GPUs instead. The first thing to note is the Big Bang Marshal that we told you about late last year, the 8 slot Z68 board, is now shipping. Get them while they are hot. We won’t point out how many PCIe lanes the Z68 chipset has, or mention that you might want to wait until their next two boards are out if you want more than a sane number of GPUs in a machine. 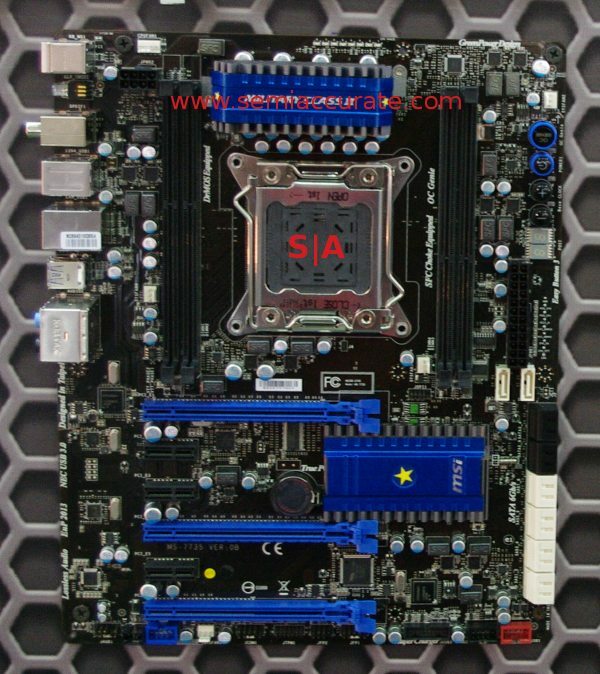 Yes, MSI had an X79 board on display too, and this one is called the X79A-GD65. 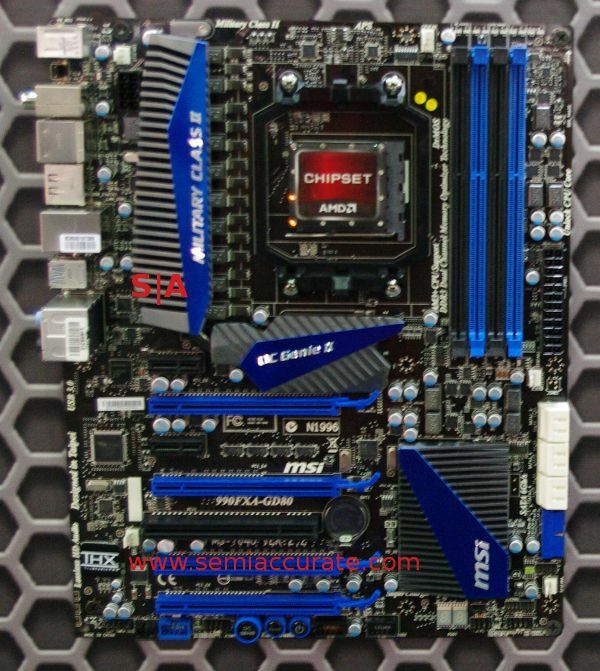 It has X-Fi, 10 SATA6 ports, 4 DIMM slots, and three real PCIe slots. If you are serious about GPU performance, this is one of two chipsets to consider. The other is the 990FXA-GD80 below, the AM3+/Bulldozer board in the same class. This one does 3-way SLI and 4-way CrossfireX, and has a lot more bandwidth than the X79, so 4 GPUs are quite doable. What the X79 vs 990FX battle comes down to is raw CPU speed vs connectivity, which one matters more to you? So, what’s next? 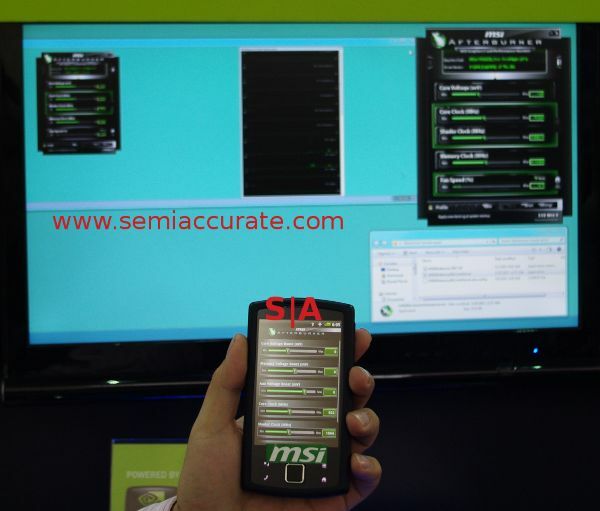 How about PCIe3? Yeah, the next gen of storage is here, or at least half here. 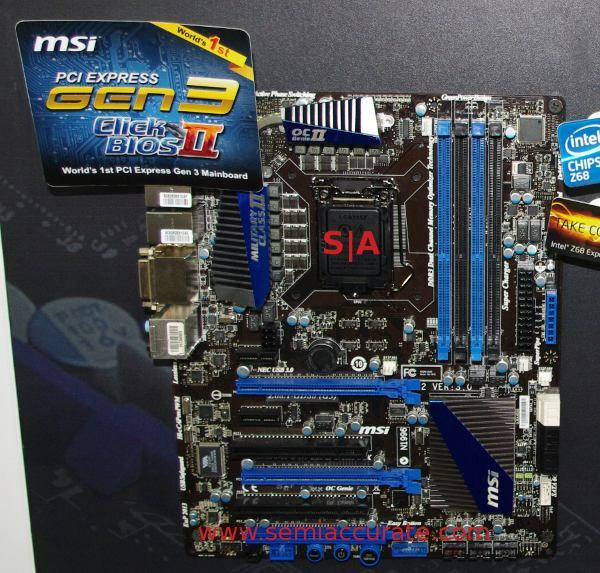 The MSI Z68A-GD80 is fully PCIe3 capable, the problem is that the only chip you can plug in to it is not. Sandy Bridge does do PCIe3, but Intel in it’s infinite wisdom is not turning it on. I guess they want to sell us Z69 boards in a few months. That said, the boards are ready whenever Intel feels generous, or Ivy Bridge comes out. Moving on to GPUs, we are in the long wait until the next gen parts come out, Q1/2012 at the earliest, but innovation continues. MSI’s N580GTX Lightning Xtreme Edition is just what it sounds like, a high end OCing 580GTX/3GB. There are two nifty features on this one, when you turn it on, the fans spin backwards to blow dust out and keep the heatsinks tidy. Not exactly groundbreaking tech, but really useful. The other bit to note is the blue fans. They are color changing, and when the ambient temps hit 45C, they will turn white.